Robert Lomas is the co-author of several previous works on the subject of Freemasonry including "The Hiram Key," "The Second Messiah," and "Uriel's Machine." A Freemason himself, Dr. Lomas is an engineer by profession and teaches technology management at Bradford University in Yorkshire. This is his latest offering in an ongoing series of books exploring the history, doctrine, polity and ritual of the Freemasonic Order. 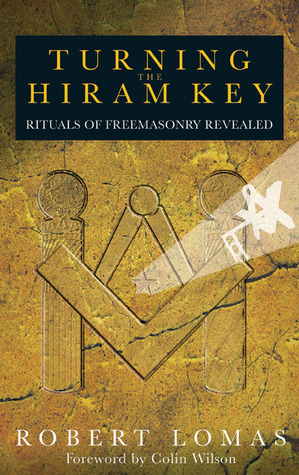 "Turning the Hiram Key" is a detailed, step by step elaboration of the initiatory rituals of Freemasonry, at least as it is practiced in the 'regular' lodges of the United Kingdom, the author's personal transformation resulting from his participation, and an explication of the methods of pedagogy underlying those rituals.The book is divided into three distinct parts: the first dealing with Dr. Lomas' personal experience of the rituals and an appreciation of their results, the second with the psychology underpinning the use of ritual as an instructional method, and the third offering a summarization of the preceding two, along with, although seemingly incidental to the book's purpose, a fascinating overview of the "Kirkwall Scroll" issue, whose discovery and scientific dating has turned so-called 'mainstream' accounts of Freemasonry's origin in 1717 London deservingly on their ear.I thoroughly enjoyed parts one and three of this work, particularly for his deeply personal accounting of the effects felt as a result of his Masonic involvement that the author undertakes (and it is worth noting that he accomplishes this end without even the hint of transgressing any initiatic vow, no small thing). The second part of the book, captioned "The Hidden Mysteries of Ritual and Myth" I found to be difficult to read and more than a bit tedious (although its reading may be of profit to a reader unfamiliar with the issues dealt with). Nonetheless, the first and third sections are more than amply worth the price of this volume.I enthusiastically recommend this volume to anyone with any degree of curiosity about the `deeper side' of Freemasonry. Freemasons who truly understand the Craft will applaud Dr. Lomas' efforts. One of the first books I read on Masonry. Gives a well rounded scope for the Master Mason. Robert Lomas, of of the authors of The Hiram Key, which explored an obscured aspect of masonic history, returns with Turning the Hiram Key. A lecturer at Bradford University with degrees in Electrical Engineering and a PhD in Physics, Lomas discusses the first three degrees and the effects they have on the initiate. Ritual and symbolism have effects on the consciousness of all who take part, affecting their neural and limbic systems whilst impressing a ornate philosophy. Lomas discusses what the rituals do to mason's brains (and minds), and then explors the history of masonic ritual and the mysterious Kirkwall Scroll, whose age and importance is downplayed by the the United Grand Lodge of England (UGLE). I won't give away any spoilers, but Lomas believes, along with other masons throughout history, that masonic ritual with it's arcane symbolism and lessons is a non-religious path towards cosmic consciousness akin to religious bliss or epiphany, or the reverence which the rational, scientific mind feels for the whole of creation - an epiphany uniting the individual with the totality of existence. It is an ancient system of spiritual illumination. A more scholarly and also more personal book than The Hiram Key, recommended for masons worldwide (although the specific rituals may very slightly from country to country). This is a worthwhile book for anyone interested in Freemasonry. The author has published widely on the topic. In this volume he maintains that the rituals and symbols of Freemasonry are actually a form of spiritual science, designed to enable a person to experience deeper spiritual insights. It is well written.One quote that I found helpful is taken from George Orwell: "In effect, it must come down to giving words a physical (probably visible) existence. Merely talking about definitions is futile; one can see this whenever it is attempted to define one of the words used by literary critics (e.g. 'sentimental', 'vulgar', 'morbid', etc.). All meaningless-or rather; having a different meaning for everyone who uses them. What is needed is to show a meaning in some unmistakable form, and the, when various people have identified it in their own minds and recognized it as worth naming, to give it a name. The question is simply one of finding a way in which one can give thought an objective existence." Lomas, coming from a fairly scientific viewpoint, explores the rituals of Freemasonry and the effect it has on the brain. A fair and welcomed balance to the overabundance of occult studies I’ve read so far, Lomas offers a simple but well thought out interpretation and explores the nature of myth, ritual, and the brain. This is an exposition. For those that are Masons, or will never be Masons, this is a great discussion of what goes on in the Lodge. For those that might, one day, decide they want to be Masons, hold off on this book. It will ruin the effect that Lomas himself is describing. The less you know, the more impressive the ceremonies will be. Still, it was an interesting interpretation. A well written book and one that takes the reader stage by stage though the ceremonies of Freemasonary. The first, second and third degrees are described from his own perspective which he talks of his own feelnfgs, fears and spiritual enlightenment now as a freemason.An exxcellent novel the only critism I would have ia about three quarters thought then novel the writer speaks of the ritual brain which I found a little heavy going.other than this worth reading but back this up with some other historical books on the subject. I will read it again because therte are some things I would like to refresh myself with. Interesting read for the Mason (or someone interested in Masonry) who would like to apply a modern model on why it's rituals are effective and positive for those who experience them. Although deeply personal to the experience of the writer, I found the book informed my own experience. Worth a read. The personal account of the author's initiation is worth reading. The rest of it is a bit silly.